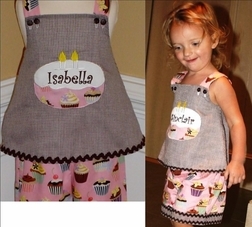 This is our birthday outfit using the pretty pink cupcake fashion fabric! 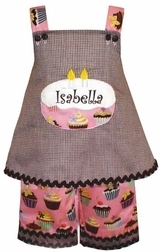 The outfit begins with a brown gingham Callie style swing top with cupcake fabric straps. The cake is made with white fabric frosting, the cupcake fabric for the cake, and your little girl's name in brown across the frosting if you choose that option. The trousers are made with the cupcake fabric in any style offered below, and are trimmed at the bottom with a strip of brown gingham and brown ric rac.